Made of a full 14-ounce nylon carpet- this Cargo Area Tray is molded with raised edges to protect against and contain spills- dirt- grease and grime. It is custom molded to fit the exact contours of the cargo space- yet removes and installs in seconds for easy cleaning. Color matches the interior for a premium stylish look. Also equipped with Cargo Loks to help prevent items from moving around on the floor. Cargo Loks are made from high impact thermoplastic. 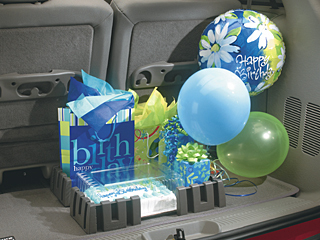 Velcro hooks on the bottom grip securely to the surface of the Cargo Tray and can be easily adjusted to fit your needs. Charcoal Gray- Fits in the bottom of the third row seating bin (or on top of the Third Row Cargo Bin) and includes four Cargo Loks and Mopar logo. Adjustable and removable.